An interactive theatre project has boosted the confidence of women fish vendors and inspired them to lobby for government recognition of their right to safely and legally sell fish. Exposed to the intense Egyptian sun, a woman sits by the side of a dirt road selling freshly harvested tilapia from a local fish farm. Tired after rising at dawn to buy her produce, she is approached by a man who demands that she pay him a fee for her roadside stall or he’ll force her to sell elsewhere. She protests, but with no work license or union support there is little she can do. Their exchange escalates and the man upturns her icebox in anger, spilling her fish across the road. 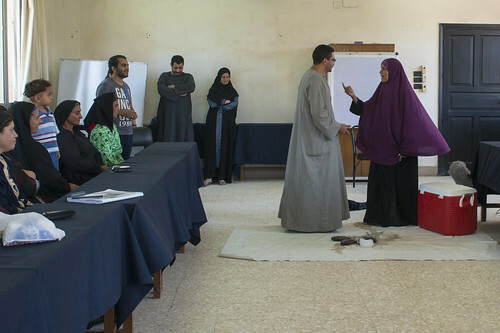 The scene is being performed by a female fish retailer in the Egyptian town of El-Mineya, as part of an interactive theatre project that has equipped 900 women to confront the challenges they face as they earn a living. Magda Eid, a mother of five who sells fish to support her family, watches on with 21 other women as the scene continues. “In these theatre training sessions, we practice interaction training on the social problems that could face women fish retailers in the community. The trainer encourages the women to interact in the show, so they start to think and raise the solutions for their problems,” Magda explains. The trainers themselves are also fish retailers who have learned to facilitate the sessions through the Improving Employment and Incomes through the Development of Egypt’s Aquaculture Sector (IEIDEAS) project funded by the Swiss Agency for Development and Cooperation. 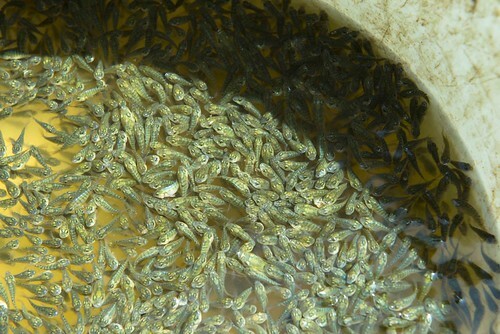 The aquaculture sector provides full time employment for more than 100,000 people. 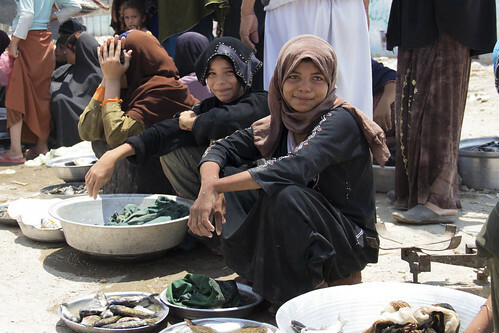 However, due to social and religious norms, informal fish retail is one of the few segments of the industry where women can work and it’s a job that comes with many hazards. Without licenses to sell fish in the market, the women retailers have no protection and are frequently harassed and forced to pay unofficial retail fees by local bullies. Exposure to the elements affects the women’s health and the heat from the sun often causes their produce to spoil, reducing the amount of income they can earn. “These problems are negatively affecting every woman’s life. If she lost her fish as we saw in the show, how she will earn money for her family expenses, such as food, medicine, clothes and school fees?” Magda asks. The interactive theatre approach is an active learning method tailored for illiterate and poor groups. The sessions help the women learn a variety of skills including negotiation, problem solving and advocacy. “Before the project, women retailers were working individually. Each one of us only cared about selling our fish. But now after joining the training, we have learned to work as a group,” she adds. 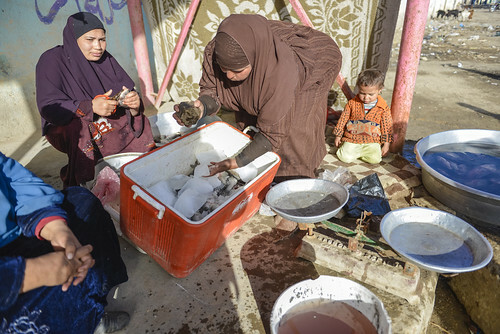 As a result of the project, the participants formed the Women Fish Retailers Committee, of which Magda is the leader in her village of Deir Abo Hennes in Minya. Together the committee members successfully lobbied the local government of El-Mineya, which made a milestone decision to issue the vendors with official retail licenses. 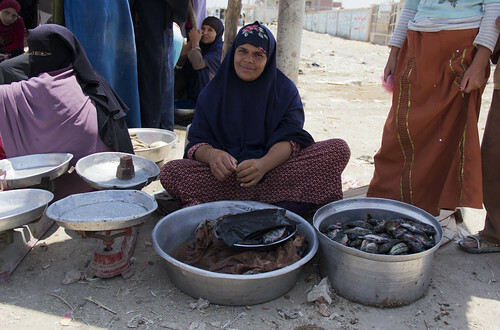 In Fayoum, a similar group worked with a local Community Development Association to construct a sheltered marketplace that provides a regular location for customers to purchase fish. With concrete floors and running water, the new marketplace also provides a safe and hygienic area for the women to trade. “With support, a woman can stay safe in the market and have the power to sell her fish like any other retailer,” states Magda. “I have realized my rights in the community and how to go the officials to ask for my rights,” she says. The IEIDEAS project is part of the CGIAR Research Program on Livestock and Fish and is implemented in five Egyptian governorates by CARE, in partnership with WorldFish.